The remains of Fr John Cummins are taken from the Church of the Most Holy Rosary Abbeyleix to his home town of Newbridge in Co Kildare. Abbeyleix came to a standstill in mourning for the funeral mass of its late Parish Priest Fr John Cummins. Bishops, priests, family, friends and local people gathered in the Church of the Most Holy Rosary on a crisp bright winter's morning to bid farewell to a man who left such an indelible mark in just under two years of ministry in Abbeyleix and Ballyroan. Bishop of Kildare and Leighlin Denis Nulty was chief celebrant of the Requiem Mass for the priest who was killed in a freak car accident outside his home in the Laois town last Wednesday, January 30. Opening the Mass the bishop warmly welcomed the large congregation to the funeral Mass in a parish where Fr Cummins has served for the past 18 months. Prior to that, Fr Cummins had served in Naas for four years, five years in Rome and a further five years as Chaplain at Carlow IT and 12 years in Carlow Cathedral 11 as administrator. Bishop Nulty said many who knew Fr Cummins during his various posts had been shaken by his sudden passing. "There are so many people feel bereft and adrift when someone so gifted, so able, so talented is taken away literally in the twinkling of an eye. "We are indeed broken and crushed. In the inadequacy of our language, in the heartbreak of our grief, we turn to God. We find our answer in the Crib here in Abbeyleix. God's son came to be with us not to take away the pain but to accompany us to walk with us," he said. The bishop extended his sympathy to Fr John's family who hail from Newbridge and travelled to Abbeyleix for the mass. He also welcomed the many members of the clergy, including, Archbishop Kieran O'Reilly of Cashel and Emly and Bishop Fintan Monaghan of Killaloe. In his homily to a packed church, Bishop Nulty described Fr Cummins as a man dedicated to his ministry since he was ordained in 1991 after entering Maynooth in 1984. "He loved being a priest. He gave his life to the church and for the church. He made being holy positive again. At a time when the church needs more good priests on the pitch, it feels if God scored an own goal last Wednesday evening. John was not just a good priest he was a great one," he said. 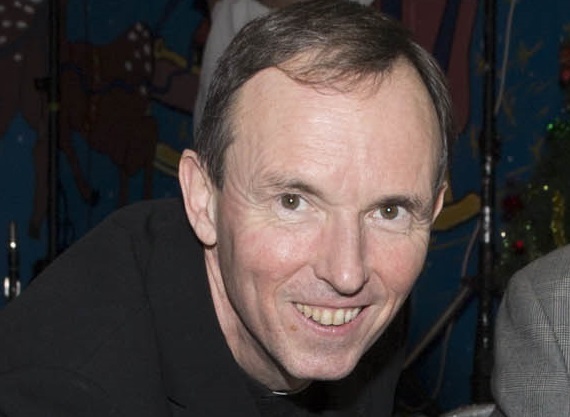 Bishop Nulty said he appointed Fr Cummins to an evangelical role for the dioceses in 2014. "I think that the past few days have been a powerful message for all of us - priest and people - of evangelicalism. It crystalised the fondness the people of all ages, faiths and levels of commitment, engagement and practice have for their local priest. The gift of the priesthood is deeply appreciated by one and all. The church is very dynamic, very alive at a local parish level," he said. He recalled his first Christmas in Carlow as Bishop of the diocese. He remembered Fr Cummin's multilingualism as shown when he celebrated midnight mass in Carlow Cathedral. He also recalled that the crib remained in place in the cathedral until February 2 - something John had a 'thing' for. Poignantly, the crib was still in place in the Church of the Holy Rosary Abbeyleix for the funeral mass last Saturday. Bishop Nulty said Fr Cummins was not a man for an orderly desk because he was always working and planning. "I am certain he left his desk in Abbeyleix last Wednesday afternoon with plans to return to complete the Catholic Schools week liturgy in Heywood the following day," he said. The bishop said he and the diocese have been inundated with tributes. "Every message, every tribute said the same thing. John was gentle, loyal pastoral ...he was a great man to stay in touch with friends as many lay as clergy," he said. Fr Cummins was described as someone who wore his high academic qualifications very lightly but had 'razor-sharp intellect'. He was also described as wearing his spirituality on his sleeve and was a man of deep prayer and reflection with more to contribute. Bishop Nulty touched on Fr John's humanity. He spoke of an old backpack that went everywhere with Fr John from his trips abroad to the Festival of the Families where the bishop ended up wearing John's much smaller Alb after his own vestments went missing in the RTÉ tent with the Killaloe dioceses. He remembered a skydive the late priest did in Clonbollogue with three other priests in 2015 to raise funds. "He wasn't back to normal for weeks," said the Bishop. He thanked all who attended and sensitively managed the scene of the accident. Concluding the Mass Bishop Nulty thanked Fr Ger Ahern, the predecessor of Fr Cummins as PP of Abbeyleix for overseeing the organisation of the mass. He thanked the community of Abbeyleix, local schools for their role in the funeral mass. He also thanked the Ballyroan and Abbyelix choirs. Students from Scoil Mhuire, Abbeyleix, Scoil Eoin Phóil Naofa II, Ballyroan and Heywood Community School formed a guard of honour as the remains were taken from the church led by Bishop Nulty and other priests. Teachers joined the students as they escorted the hearse, which was followed by hundreds of local people to Heritage House, where the Rosary was recited led by Bishop Nulty. Immediately afterwards, the remains were taken to repose at the Cummins family home in Newbridge. Mass will be celebrated at 11 am on Monday morning in St Conleth's Parish Church in the Kildare town with interment afterwards in St Conleth's Cemetery.